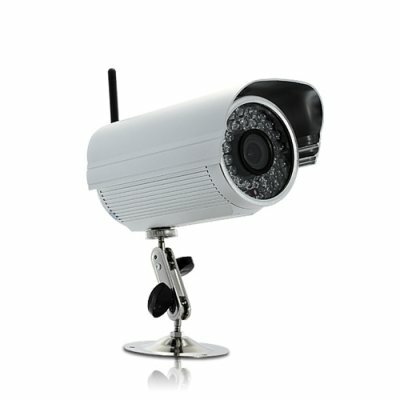 Successfully Added Skynet Pro - IP Security Camera (WIFI, IR Cut-Off Filter, Night Vision, 2x Optical Zoom) to your Shopping Cart. Now with improved color accuracy, increased focal distance, additional IR sensors for better night vision, 2x optical zoom and mobile phone support. All this and much more from our most versatile IP camera to date, the Skynet Pro. Surveillance Anywhere: From your office in Paris, look in on your home in Lisbon. From your hotel in Moscow, monitor your business in Barcelona. You can even use your mobile phone to view this security camera from anywhere in the world! Extremely easy to setup and use: It's so simple to setup even a seven year old could do it. Don't believe us? One, plug the camera into a power outlet. Two, connect your Ethernet cable to The Skynet, if you want a wired connection. If you're going wireless, attach the WIFI antenna. Three, install the software which will generate an IP address for you. Four, put that IP address into any Internet Explorer browser and PRESTO! You're viewing what the camera sees! Even if you're half way across the world. Clearer Images: An Infrared (IR) cut-off filter is now used to produce much better color reproduction in both daylight and nighttime. If you have been frustrated with the lousy colors most security cameras produce then this is the ideal security solution for you. If you are looking for a bulletproof IP security camera with excellent image quality and ease of use, then look no further than the Skynet Pro. Order now while supplies last and we will express ship your package to any doorstep worldwide and even back the Skynet Pro with our full one year warranty.